Founded in 1999, bet-at-home is an online sports betting and gaming company with c 300 employees. It is licensed in Malta and headquartered in Dusseldorf, Germany. Since 2009 bet-at-home has been part of Betclic Everest, a privately owned French online gaming company. bet-at-home (BAH) is a long-established European sports betting brand, successfully cross-selling into gaming. Regulatory risks are high, as witnessed by IP blocking in Poland and Switzerland and the company has issued guidance of a c 10–20% decline in EBITDA for FY19. Nonetheless, BAH has consistently produced strong operating cash flow and its ability to pay high dividends is very attractive. The stock is up 28% ytd and trades at 14.9x P/E, 10.9x EV/EBITDA and 8.5% dividend yield for FY19e. Note: *EPS are normalised, excluding amortisation of acquired intangibles, exceptional items and share-based payments. **Includes special dividends. At FY18, BAH’s main markets were Germany (36% of gross win), Austria (30%) and Eastern Europe (19%). The mix of gross gaming revenue (GGR) was 42% sports and 58% e-gaming (casino, poker), demonstrating a successful cross-selling strategy. Formal licensing has not been introduced in many of its main markets, where BAH pays taxes and VAT as applicable and operates under its EU licence. Regulatory risks are high, as shown by IP blocking for e-gaming in Poland and Switzerland, with similar proposals (subsequently withdrawn) in Austria. Over the past five years, BAH has faced an environment of rising taxes and uncertain regulation across its core markets. However, management has consistently delivered strong cash flow and FY18 EBITDA was reassuringly in line with guidance (although GGR was 4.5% light). With legal uncertainty in Switzerland combined with no major sporting events this year, we forecast a 4.9% decline in FY19 GGR, returning to 2% growth in FY20. Assuming no major changes to gaming taxes, we forecast EBITDA margins of c 23% going forward and annual operating cash flow of c €25m, which underpins the ability to pay high dividends. BAH’s shares have rebounded 28% ytd, but are still down c 60% from the highs in 2017, with regulatory concerns continuing to weigh on sentiment. The stock trades at 10.9x EV/EBITDA and 14.9x P/E for 2019e, which is at the top end of the peer group, but BAH’s healthy net cash position and 8.5% forecast dividend yield are very attractive (and over 70% higher than the peer group average). In our view, a major catalyst for a further re-rating would be concrete evidence of positive regulation in core markets, especially Germany and Austria. BAH is an online sports betting and gaming company, licensed in Malta and headquartered in Dusseldorf, Germany. It was co-founded in 1999 in Austria by Franz Ӧmer and Jochen Dickinger, who currently have a 1.0% and 2.8% stake, respectively. The company listed in Germany in 2004 and in 2009, Betclic Everest, a private French online gaming and sports betting group, acquired a 49.2% stake. At FY18, Betclic Everest had a 51.7% stake. BAH’s core markets are Germany, Austria and Eastern Europe. Most of these countries have limited formal gaming regulation and BAH operates through its sports betting and gaming licences issued in Malta. The company pays taxes and VAT as applicable, but regulatory risks are very high. Given the importance of regulation to the investment thesis, we provide a fuller analysis of the regulatory framework on pages 6–11. Strong market positioning: as evidenced by its five million customers, BAH benefits from strong brand recognition and an attractive product offering across its core markets. The company has successfully cross-sold into e-gaming, which now comprises 58% of GGR. Secular growth: European online gambling is a secular growth market, with a CAGR of 6.5% to 2021 (source H2 Gambling Capital 2019). Within this overall figure, we believe that BAH’s core markets are still experiencing high growth rates. Notable exceptions are Poland and Switzerland, which have banned offshore e-gaming and are likely to have lower growth rates. BAH has guided to FY19 revenues of €130–143m (c 0–10% decline) and an EBITDA of €29–33m (c 10–20% decline); we forecast €136.3m and €31.2m, respectively. 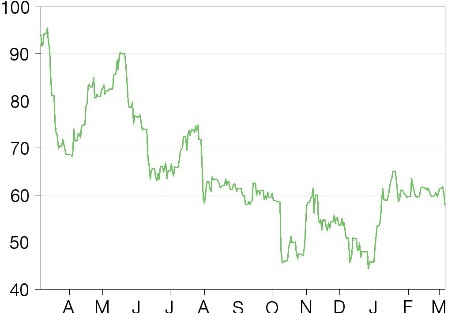 This 4.9% GGR decline is largely attributable to the lack of major sporting events in FY19, as well as the legal uncertainties in Switzerland. From FY20 onwards, we forecast a 2.0% growth, as BAH participates in market growth. 80% cash conversion and 8.5% dividend yield: the online gaming industry is characterised by very high cash flow generation and BAH has consistently delivered strong operating cash flow (cash conversion of c 80%). This is despite ongoing regulatory changes and increases in local taxes. At FY18, the company reported net cash of €70.6m (excluding €7.7m customer balances) and we estimate operating cash flow of c €25m per year going forward. This underpins a strong dividend yield (FY19e: 8.5%), which comprises a €3.0 ordinary and €2.0 special dividend (FY19e). In our view, the dividends are an important feature for BAH’s parent company Betclic Everest SAS (Betclic), which has itself been investing heavily in technology. We therefore believe the pay-out ratio is likely to remain greater than 100% over the next few years. Competitive markets: the online gaming market is highly fragmented and successful companies typically need to invest heavily in marketing. BAH has been no exception and marketing spend has historically been over 30% of revenues (25–30% more recently), with higher levels of spend ahead of critical sporting fixtures (eg FIFA World Cup). To maintain its customer base, we would expect this level of spend to continue (we forecast 27.5% annually). Regulatory uncertainty: 2017 legislation in Poland (previously BAH’s third largest market) included punitive taxes for sports betting, as well as imposing a monopoly on e-gaming. IP blocking for e-gaming will be introduced in Switzerland from July 2019 (c 1–2% of GGR) with similar proposals (since reversed) in Austria. The framework is also unclear in Germany (BAH’s largest market), although we believe it is highly unlikely that a total ban will be implemented. For a fuller discussion on regulation, see pages 6–11. BAH’s shares have rebounded 28% ytd, but are still down c 60% from the highs in 2017, with regulatory concerns continuing to weigh on sentiment. With Switzerland implementing e-gaming IP blocking in July, investors are looking for comfort in the larger markets. In our view, a major catalyst for a further re-rating would be concrete evidence of positive regulation in Germany and Austria. The most straightforward way to value BAH is via a peer group comparison, and Exhibit 9 on page 14 compares it to many of the European gaming operators. For FY19e, BAH trades at 14.9x P/E and 10.9x EV/EBITDA, which is at the top end of the peer group, but its 8.5% dividend yield is over 70% higher than the peer average. We note that although its closest competitor in Germany is bwin (GVC), GVC’s scale and retail business make the overall comparison slightly less relevant in our view. Within the group, we believe the nearest peers are the Scandinavian players (Kindred, Betsson) that operate throughout Europe and also have significant exposure to grey markets. We have also performed a DCF with a terminal growth rate of 2% and a terminal EBITDA margin of 23%, vs 25% in FY18. Using a WACC of 8.0% produces a value per diluted share of €67. Our valuation assumes that there are no major negative changes to the current trading environment. If we flex the WACC to 9% to account for a higher risk profile, our DCF would be €58.7. Our core €67 DCF valuation equates to 12.8x EV/EBITDA and 17.1x P/E for FY19e, which is clearly at the top end of the peer group, but still equates to a dividend yield of 7.5% for FY19e. Since 2015, BAH has increased net gaming revenues (NGR) and EBITDA by 5% CAGR, despite the ongoing tax increases and other regulatory challenges. This includes a 1.4% decline in gross gaming revenue in FY18, which was predominately a result of the IP blocking in Poland. Although the impact of the Polish regulation has now been lapped, we note that there are no major sporting events in FY19 and the legal situation for both online sports betting and gaming in Switzerland is very unclear (we assume BAH will exit the market in mid-2019). We therefore forecast a 4.9% decline in GGR for FY19, returning to a 2% growth in FY20, as BAH participates in general market growth. Our forecasts assume no changes in regulatory regimes in key markets and assume no major new markets are entered. In line with recent trends, we forecast overall marketing spend of c 27.5% of GGR and our forecast EBITDA margin is 22.9% for FY19 and 23.4% for FY20. Altogether we estimate that EPS will decline by 15.5% in FY19, with a CAGR of 4.1% for FY19–21. Our FY19 revenue (€136.3m) and EBITDA (€31.2m) forecasts are in line with the company guidance of FY19 revenues of €130–143m and an EBITDA of €29–33m. BAH ended FY18 with net cash of €70.6m (excluding customer balances) and has proposed a €6.50 dividend to be paid in May 2019. We forecast a continued high dividend distribution of €5.0 per year (€35m). This equates to a c 130% payout ratio, which we believe is sustainable for the foreseeable future, given the high net cash position and consistent operating cash flow of c €25m per year. We further believe that the cash distribution is an important feature for the parent company (Betclic) and therefore the generous dividend policy is likely to remain in place in the near term. Clearly this is a finite game, and therefore at some point in the longer term, the payout ratio would need to return to less than 100%. The key sensitivity for BAH is regulatory uncertainty across all core markets. The most drastic scenario is a situation where governments implement IP blocking (eg e-gaming products in Poland and Switzerland) or where taxes are significantly increased (15% to 21% in the UK, which is a less important market for BAH). More generally, online regulators have been imposing fines and/ or injunctions on a number of companies for a variety of different reasons (social responsibility measures, AML, advertising breaches, etc) and it is very likely that BAH will continue to receive occasional fines (currently the company is disputing injunctions in the Netherlands and Germany). The online gaming market is also maturing in many European markets and there is a risk that the company will not be able to grow at the expected rate without increasing marketing spend. At a corporate level, we note that the company is majority owned by Betclic and although this certainly brings many benefits (in the form of better purchasing power, etc), it is important to note that a majority shareholder may not always have the same interests as outside investors. BAH was founded in Austria in 1999 as a pure online sports betting operator. Benefiting from the growth of the online gaming market throughout Europe, its portfolio has expanded to include online casino, live casino, Vegas games, poker and virtual sports. The current mix of GGR is 42% sports and 58% e-gaming, demonstrating successful cross-selling into gaming. The BAH brand name is very strong and its five million customers are testament to an attractive product offering and competitive odds. In terms of technology, BAH has developed its own front-end (CRM, etc) capabilities and outsources much of the ‘back-end’ to other platform providers. These include Net Entertainment (casino, slots), Microgaming (sports), Evolution gaming (live casino) and Playtech. As is typical for gaming companies, these arrangements are based on a revenue sharing agreement, with costs reflected in ‘other operating expenses’. One major advantage of the Betclic relationship seems to be better purchasing power as the third-party provider fees appear to be slightly lower than peers. The company’s core markets are Germany (36% of gross win), Austria (30%) and Eastern Europe (19%). A few of its smaller markets are fully regulated (eg UK), but formal licensing has not yet been introduced in many of its main markets, where it pays taxes and VAT as applicable and operates under its EU licence (Malta). Regulatory risks are high, as shown by 2017’s IP blocking in Poland for e-gaming and similar measures to be enforced in Switzerland from July 2019. We provide a fuller analysis of regulatory risks across the main markets on pages 6–11. For FY18, gaming and betting volumes grew 0.4% to €3.188bn, while GGR fell by 1.4% to €143.3m. The decline was predominately due to the closure of the Polish e-gaming market, which was not fully offset by strong FIFA World Cup revenues. We note that in a few of its smaller markets, BAH is unable to cross-sell into gaming (eg Poland), which may have an impact on the product mix going forward. bet-at-home.com is one of the largest sports betting providers in Europe. In 2018, the sportsbook comprised 42.2% of gross gaming revenues. During the year, sports bets were placed on more than 411,000 events in 83 types of sport, ranging from football to tennis, volleyball and ice hockey on to motorsports. Bets range from single bets to combi-bets or system bets and c 60% of the sportsbook is from in play. BAH’s products are available in 11 different languages. In 2018, gross gaming revenue (Hold) for the product sports betting amounted to c €60.5m, which equates to a sports win margin of 10.8%. This level is considerably higher than international peers such as Kindred and Betsson and broadly in line with GVC, whose subsidiary bwin is BAH’s closest competitor. 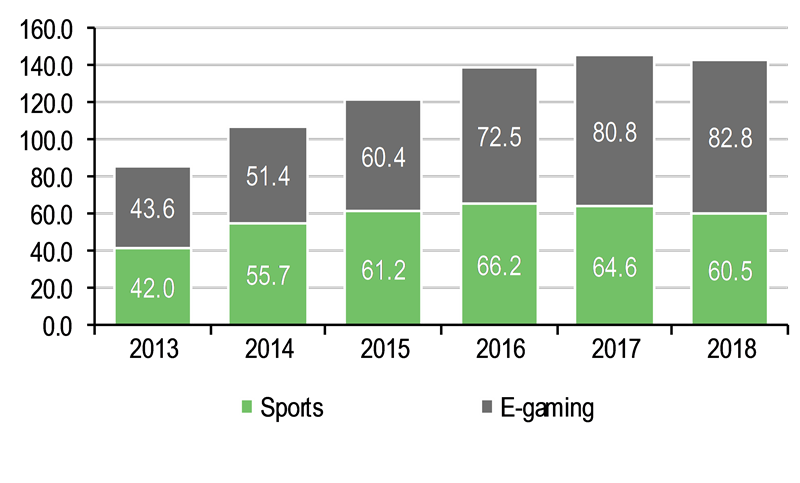 E-gaming comprises 57.8% of total GGR, indicating a successful strategy to cross-sell from sports to e-gaming. The product suite includes casino, poker, Vegas games and virtual sports. It is interesting to note that this strategy is similar to peers such as bwin (GVC) and that pure casino operators are rarely able to meaningfully replicate the cross-sell in the other direction (ie from casino to sports). Casino (c 53% of GGR): after the introduction of sports betting, casino was launched in 2005 as the second product. Casino includes classic games such as roulette, blackjack, baccarat and slots. Live casino was introduced in 2011 on the Evolution Gaming platform and comprises c 20% of e-gaming. Virtual sports (c 1% of GGR): BAH launched virtual sports betting in April 2015, a type of betting that revolves around virtual simulations on various sports types. This includes high-quality 3D videos as well as authentic teams for a realistic gaming experience. A random generator ensures the reliability of the results. Products within this segment include virtual football league, virtual basketball league, virtual tennis open, virtual dog racing and virtual horse classics. Vegas (c 3% of GGR): the Vegas offering replaced the Games channel in 2017 and is intended to be an introduction to online gaming, requiring limited experience or skills. Products include table and card games, slots and real casino classics. Slots that are based on well-known TV shows or Hollywood blockbusters are especially popular. Poker (c 1% of GGR): through a second-tier subsidiary, BAH is part of one of the world's largest poker networks (iPoker- Playtech). Games include Texas Hold'em, Six Plus Hold'em, Omaha High, Omaha Hi/Lo and Speed Poker. From this product, BAH also effectively cross-sells into casino, with slots and blackjack available on the poker software. According to H2 Gambling Capital (H2GC), the European online sports betting and gaming market is expected to grow at a 6.5% CAGR between 2018 and 2023 to c €33bn. We note that Europe comprises approximately half of the global online betting and gaming market. As shown in Exhibit 4 below, a key driver for online gaming growth has been increased mobile penetration rates and H2GC estimates that mobile usage in Europe for gaming will rise from 41% in 2018 to 55% in 2023. In this context, BAH derived 54% of its GGR in FY18 from mobile users, and is clearly a beneficiary from increased mobile penetration. White – fully regulated: at one extreme, the UK is by far Europe’s largest regulated online gaming market with an estimated c €6bn of GGR. As a result of the permissive regime, the UK has been an important market for many online operators. We note that, partly as a consequence of its maturity, growth rates now appear to be slowing. BAH has limited exposure to the UK. Black – totally illegal: at the other extreme, there are a few countries where gambling is totally illegal (eg Turkey). BAH has no exposure to black markets. 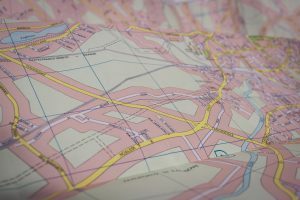 Grey – unclear regulatory framework: in the middle, there are a vast number of jurisdictions where the regulatory framework is far more ambiguous (or grey). It is within these grey markets that BAH has concentrated its marketing efforts and these notably include Germany (36% of gross win), Austria (30% of gross win) and Eastern Europe (19% of gross win). Given the regulatory framework across most of its markets, BAH typically operates through its sports betting and gaming licences issued in Malta. Under EU law, these licences are effective in all EU member countries due to the freedom of movement within the EU, as long as online gaming and sports betting is legal in the respective member country. In some markets (such as Poland), BAH has been subject to IP blocking for e-gaming, which is generally considered a violation of EU law. There are also many inconsistencies prevalent in the German market. In this section, we discuss the regulatory challenges across the company’s core markets. Source: bet-at-home. Note: Eastern Europe comprises Bosnia and Herzegovina, Croatia, Montenegro, Poland, Serbia, Slovakia, Slovenia. Western Europe comprises Cyprus, Finland, Ireland, Liechtenstein, Malta, Netherlands, Sweden, Switzerland, UK. There is a high degree of inconsistency within the German regulatory framework and a reasonably high risk of change. After many years of confusing legislation and disagreement among member states, Germany remains a grey market, where companies operate through another European licence (typically Maltese) and pay VAT on casino revenues and a turnover tax on betting. BAH currently pays betting tax/VAT on all of its German revenues. In Germany, BAH was among the 20 successful applicants for a sports betting licence in 2014. However, this process was subsequently suspended after being challenged by operators who failed to secure licences and therefore licences were never granted. In 2017, a proposed Second Amendment to the State Treaty on Gambling would have seen all 35 operators (including BAH) that fulfilled the minimum criteria in the licensing procedure receiving sports betting licences in 2018. However, the proposed Second Amendment was never ratified, with a growing number of states calling for more significant changes to the State Treaty on Gambling than those presented by the Second Amendment. Recently, ruling coalition parties in the German state of Hesse have said they will withdraw from the proposed German Interstate Treaty on Gambling (IST) if no progress is made on ratification by the end of 2019. Discussions are underway between the states and the final draft of the newest regulations is expected to be unveiled at the German prime ministers’ conference, taking place on 21 March 2019. Four key states could potentially implement their own regulatory regimes, regulating not only sports betting but also online casino. These states are Schleswig-Holstein, North Rhine-Westphalia, Rhineland Palatine and Hesse. The biggest area of confusion surrounds the issue of online gaming, with online casino and poker technically illegal under the current reading of the Interstate Treaty, a ruling upheld in the recent case against 888 (one of BAH’s competitors). 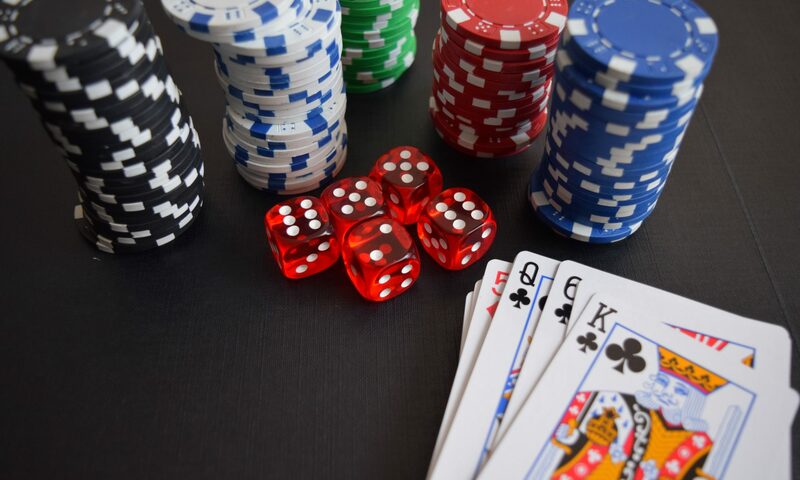 BAH has also been subject to a number of e-gaming related injunctions (Berlin, Federal State of Hesse and Schleswig-Holstein), although in all cases the company has continued to offer casino products in those regions, as it believes the injunctions are a violation of EU law. There has been no conclusive result to any of these injunctions. It is also possible that a move to a formalised sports betting regulated regime could kill off the larger online gaming sector and therefore the majority of operators continue to lobby for the creation of a legal framework of licensing for casino and poker as opposed to a ban. There is limited formal gaming regulation in Austria and online gaming is dominated by Casino Austria, which is partially state owned. Similar to many other EU jurisdictions, offshore operators such as BAH have been able to participate via EU licences and we estimate that foreign operators account for c 60% of the Austrian market. On 27 February 2018, the Austrian Ministry of Finance published a draft bill on the amendment of gambling laws. This draft envisaged that online gaming providers without an Austrian licence would be blocked by ISPs from October 2018. However, the draft was subsequently repealed days later and no amendment has since been published. The new government intends to include online sports bets in the gambling law, with the tax income directed towards sport. A new regulation for online casinos in Austria is also being discussed but there is no clarity on when a new draft law will be published. Until 2017, BAH operated in Poland via its EU licence for both sports betting and e-gaming. However, in April 2017, an amendment to the gambling laws of Poland became effective and the state monopoly (Totalizator Sportowy) was granted exclusive rights to operate remote casinos and poker. Although the enforcement measures (such as IP and payment blocking) are generally considered a violation of EU law, the appeals by international operators to the European Court of Justice have been unsuccessful. We therefore assume there will be no liberalisation of the Polish e-gaming market. In terms of sports betting, private providers are permitted to apply for a sports betting licence, although the 12% turnover tax is generally considered highly punitive. Following the amendments in 2017, BAH initially decided not to apply for a licence, although it has now done so. Other recent entrants include Cherry, Fortuna, Superbet and Typiko. As a result, we expect that the contribution from Poland will be minimal in the near term, since the high turnover tax, combined with the inability to cross-sell to gaming, will limit revenues in our view. Tax rate: Total block on e-gaming apart from local Swiss casinos from July 2019. Regulatory body: Federal Gaming Board and Federal Office of Justice. In June 2018, a Swiss referendum resulted in local Swiss casinos receiving exclusivity to apply for e-gaming licences for six years, essentially barring all international operators. The new Money Gaming Act came into effect in January 2019 and international operators are required to agree a deal with a local land-based operator in order to continue serving players. We understand that BAH does not yet have any such deal. In addition, the act requires Swiss ISPs to block international sites, with the ISPs being compensated for doing so. Unlicensed operators will be blacklisted from July 2019. Since Switzerland is not part of the EU, it is therefore not bound by the EU free-trade laws and international operators are not likely to dispute the legality of this recent ruling. We note the GVC has pulled out of Switzerland entirely, on the basis that sports betting has been prohibited from January 2019. At this stage, however, the blacklisting situation remains unclear and we assume that BAH will operate until it is no longer possible (likely mid 2019). After many years of negotiations, the Dutch Senate has recently voted to adopt the Remote Gaming Bill, which will enable foreign gaming companies to receive a local licence. The new gaming legislation is expected to enter into force during Q320 at the earliest, which is when licence applications will be accepted. As expected, the gaming tax will be 29% of GGR, which is significantly higher than many other regulated markets and will certainly have an impact on net revenues. Accompanying the new law is a proposal for a two-year cooling-off period for illegal operators. It is currently unclear which operators are considered “illegal” although we note that BAH has previously received fines for unlawful advertising and operating without a licence and might therefore be included in the “illegal list”. While the conditions of the cooling-off period remain uncertain, our understanding is that this is not a complete blackout period. In December 2018, there were seven states that had already gone ‘live’ (Delaware, New Jersey, Mississippi, West Virginia, New Mexico, Rhode Island and Pennsylvania). Eilers & Krejcik estimates that these early-mover states could be generating $1.4bn by 2021 and that a further wave of states could add an additional $7.5bn of GGR in three years. Market access is the critical starting point in the US, with access predominately controlled by land-based casinos as the primary licence holders. Regulations often allow retail before mobile and the number of mobile licences/skins per casino will vary state by state. Since the repeal of PASPA in 2018, many US operators have partnered with European suppliers for their technology infrastructure and players such as Kambi, SBTech, GVC and William Hill have all entered the market. At this stage, it is unclear how BAH might benefit from the US market opening, because it also relies on third-party platforms, but it is possible that its marketing and front-end technology could be attractive to some US players. 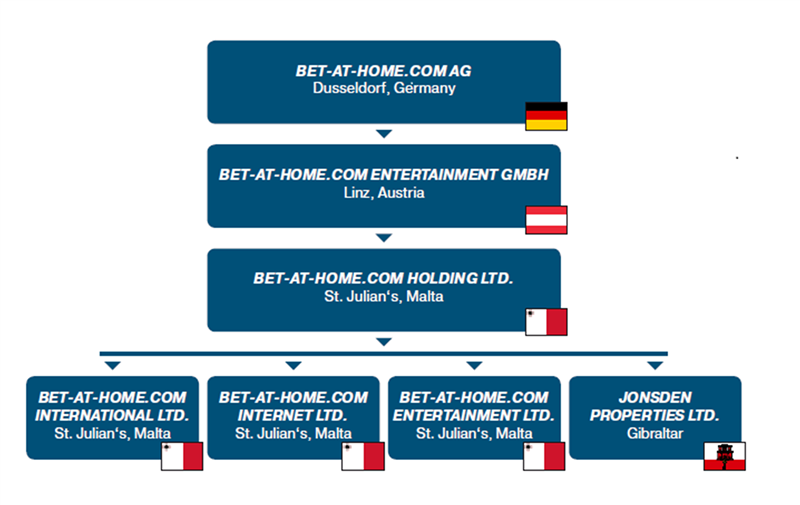 bet-at-home.com was founded in 1999 in Austria and listed on the Frankfurt Stock Exchange in 2004, with the founders selling 3.5m shares. In 2009, Betclic Everest SAS (Betclic) acquired a 49.21% stake from the founders and it currently holds a 52% stake. Betclic is a leading French group specialising in online gambling and sports betting, for which BAH provides regional strength in mid and eastern Europe. bet-at-home.com is based in Düsseldorf. The company holds 100% of bet-at-home.com Entertainment, which is based in Linz, Austria, and is essentially the main operating company in charge of the technology. The business in Malta is part of bet-at-home.com and Maltese licences enable BAH to operate throughout the EU, due to freedom of trade. BAH’s management board consists of two co-CEOS who report directly to a three-member supervisory board, some of whom are closely linked to the parent company Betclic. Unlike many of its European peers, BAH does not operate any share incentive schemes for employees and management and the only member of the board and management team that holds stock is co-CEO Franz Ӧmer, with a 1% stake. Instead, BAH’s major shareholder (Betclic) has approved variable compensation for the members of the management board. Compensation is based on share price performance; in 2017, for example, management each received a c €1m bonus. Franz Ӧmer has founded several technology and gaming companies, including bet-at-home.com, and previously worked in international consulting for business process reengineering. He studied software engineering at the Software Park, Hagenberg. Michael Quatember worked for 11 years at KPMG Austria focusing on auditing and business advisory. From February 2009 until October 2012 he was head of finance at bet-at-home.com and in November 2012 he was elected to the management board. He studied business management at the Johannes Kepler University in Linz, Austria. Attorney Martin Arendts is the founder and owner of ARENDTS ANWÄLTE law firm. He specialises in capital investments as well as gaming and betting laws. Isabelle Andres is CEO of Karina Square, a company providing consultancy services in the digital and media sector. She was previously CEO of Betclic Everest Group and has held diverse positions in the digital and media sector. After heading M&A at Vivendi Universal, Mr Nabet was an investment banker at Deutsche Bank in Paris. Since January 2008 he has been the director of the investment department at Financiere Lov. Financiere Lov is a holding company of Stephane Courbit and key shareholder of the Betclic Everest Group SAS. Injunctions and increased scrutiny by regulators: BAH has been subject to a number of injunctions in Germany and the Netherlands. Although the company is disputing the fines and continues to trade, there is a risk that it could be forced to cease its product offerings in the respective regions. More generally, the gaming sector has been subject to increased scrutiny by regulators globally. This has been particularly seen in mature regulated markets such as the UK, which has been enforcing fines for social responsibility, know your customer, source of funds and AML. Although BAH is not heavily invested in the UK, there are signs that other countries could follow suit. Additionally, some countries are seeking payment for historical unpaid taxes/VAT and BAH has built up a €0.7m provision for a VAT dispute in Switzerland. Online gaming growth is slowing in mature markets: BAH has historically grown its business across numerous unregulated markets, which continue to show signs of expansive growth. However, as these markets mature, it is possible that growth rates will slow (similar to the UK). Competitive market place: BAH operates in highly competitive and fragmented markets and some of its peers have far greater scale (eg GVC, Kindred, Betsson). To maintain momentum, it is possible that BAH will likely need to raise its marketing spend, and thereby depress margins and cash flow. Major shareholder: BAH is majority owned by Betclic Everest SAS, a private French gaming business. Although there are clearly many associated advantages (better purchasing power, etc), there is a risk that Betclic’s interests may not be aligned with other shareholders. Another by-product is the relative lack of liquidity in the shares. BAH’s shares have rebounded 28% ytd, but this is still down c 60% from the highs in 2017, with regulatory concerns continuing to weigh on sentiment. With Switzerland implementing IP blocking in July, investors are looking for comfort in the larger markets. In our view, a major catalyst for a further re-rating would be concrete evidence of positive regulation in Germany and Austria. The most straightforward way to value BAH is via a peer group comparison and Exhibit 9 compares it to many of the European gaming operators. As indicated below, BAH trades at the top end of the peer group on a P/E and EV/EBITDA basis, but its dividend yield is very attractive (over 70% higher than peers). Although its closest competitor in Germany is bwin (GVC), GVC’s scale and retail business make the overall comparison slightly less relevant in our view. Within the group, we believe the nearest peers are the Scandinavian players (Kindred, Betsson) that operate throughout Europe and also have significant exposure to grey markets. Source: Refinitiv, Edison Investment Research. Note: Priced at 6 March 2019. We have also performed a DCF with a terminal growth rate of 2% and a terminal EBITDA margin of 23%, vs 25% in FY18. Using a WACC of 8.0% produces a value per diluted share of €67. Our core forecasts assume that there are no major negative market changes (eg further IP blocking in core markets). If we flex the WACC to 9% to account for a higher risk profile, our DCF would be €58.7. Our core €67 DCF valuation equates to 12.8x EV/EBITDA and 17.1x P/E for FY19e, which is clearly at the top end of the peer group, but still equates to a dividend yield of 7.5% for FY19e. Since 2015, BAH has grown net gaming revenues and EBITDA by a 5% CAGR, despite the ongoing tax increases and other regulatory challenges. This includes a 1.4% decline in gross gaming revenue in FY18, as a result of the IP blocking in Poland, which did not fully offset momentum from the FIFA World Cup. Although the impact of the Polish regulation has now been lapped, we note that there are no major sporting events in FY19 and the IP blocking in Switzerland will affect the company from mid 2019. We therefore forecast a 4.9% decline in GGR for FY19, returning to a 2% growth in FY20. This is in the context of overall European GGR growth of 6.5% per year. Our forecast EBITDA margin is 22.9% in FY19 and 23.4% in FY20, and we estimate that after a 15.5% drop in EPS in FY19, earnings should grow by a 4.1% CAGR to FY21. Our FY19 forecasts are roughly at the mid-point of company guidance of FY19 revenues of €130–143m and EBITDA of €29–33m. Revenues: as discussed above, FY18 revenues were affected by the IP blocking in Poland, which had previously been BAH’s third-largest market. Along with the IP blocking for e-gaming, BAH’s sports offering was also impacted by the blocking. As a result, sports GGR fell by 6.3% and e-gaming grew by only 2.4% in FY18. This led to a total GGR decline of 1.4% in FY18. As a result of the IP blocking in Switzerland, as well as the lack of major sporting events in FY19, we forecast a further 4.9% decline GGR in FY19, returning to a 2% growth in FY20, as BAH participates in general market growth. Similar to prior periods, we forecast a sports win margin of c 10.5%. Our forecasts assume no major regulatory changes from this point, other than the e-gaming IP blocking in Switzerland from mid-2019 and we assume that BAH exits the Swiss market in H219. Gaming taxes and VAT: Gaming taxes and VAT amounted to €28.2m in FY18, which represents 19.7% of GGR. We estimate that these rates will remain broadly stable, although clearly this could change if markets begin to regulate and impose higher taxes (eg Netherlands from FY20/21). Marketing costs: due to numerous targeted marketing campaigns, BAH has an impressive roster of five million customers and the company has historically spent over 30% of revenues on marketing. We would expect continued high levels of marketing spend to sustain brand awareness (albeit at a lower rate than previous years). Generally, we forecast marketing spend of 27.5% of revenues, although this is likely to fluctuate depending on sporting fixtures (eg Q218 had 40% marketing/revenue ahead of the FIFA World Cup). Other operating costs: these include payments to third-party platform providers, such as Evolution Gaming and Microgaming. For FY18, total other operating costs were €22.9m, of which we estimate €6–7m was for third-party providers. We believe this level is lower than some peers, given the better purchasing power via Betclic. EBITDA: FY18 EBITDA of €36.2m equates to margin of 25.3%, which is broadly in line with prior years – an impressive achievement given the tax and regulatory changes across the various jurisdictions. Looking ahead, our forecasts assume a largely unchanged tax environment, marketing expenses of c 27.5% and stable other operating costs (as an absolute figure). We therefore forecast a near-term EBITDA margin of c 23%. Tax: BAH reported tax of €2.4m for FY18, which includes the usual income tax refund from the Maltese tax entity in Q418. Including other local taxes (25% for Austria), the combined tax rate equated to 6.8%. We forecast an effective tax rate of 8.0% going forward, which is comparable to prior years. BAH has a very robust balance sheet, with no debt and net cash of €70.6m at FY18 (excluding customer deposits of €7.7m). We note that the high cash balance is partly due to the fact that all loans to Betclic have now been paid back to BAH and dividends are effectively an ongoing means of returning the cash to the parent company. 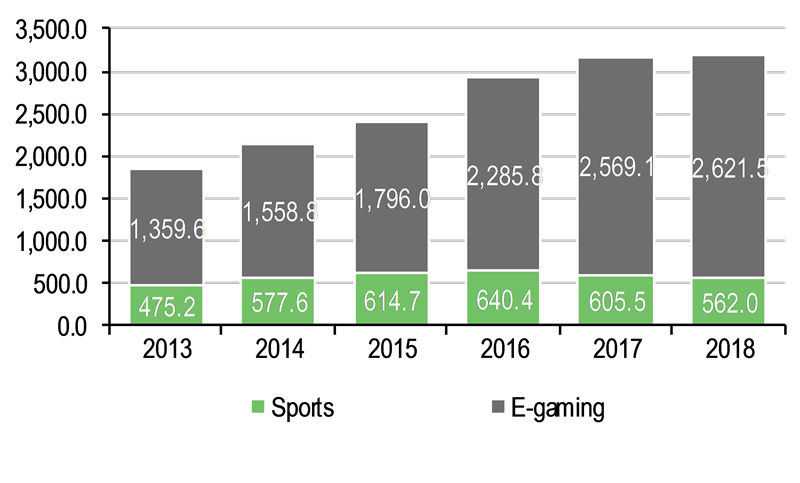 Strong operating cash flow: assuming no major changes in the regulatory environment (ie more IP blocking and tax increases), we forecast annual operating cash flow of c €25m. High dividend payout ratio: including special dividends, BAH’s payout ratio has been in excess of 150% for the past couple of years. Given the corporate structure (ie majority ownership by Betclic) and absence of an M&A strategy, we believe the company will distribute further dividends from its net cash balance. In our view, this dividend policy is most likely a function of the parent Betclic’s cash requirements and investors can therefore benefit from the policy. BAH announced a €6.50 dividend for FY18, payable in May 2019 and we forecast a dividend payment of €5.00 for the next couple of years. This equates to a payout ratio of c 130%. Clearly this is a finite game, and therefore at some point in the longer term, the payout ratio would need to return to less than 100%. Provisions: apart from the net cash, the most notable item on the balance sheet is the estimated €25.0m short-term provision, a large portion of which is related to betting fees and gambling levies (ie a timing difference relating to past revenues). These figures are our estimates, since the detailed balance sheet will be provided with the annual report on 28 March. As reported in previous accounts, there is €686,000 provision for the period from January 2017 to June 2018 relating to a possible VAT payment in Switzerland. We note that there is an ongoing discussion with the Swiss government relating to this payment. Franz Ӧmer has founded several technology and gaming companies, including bet-at-home.com AG and previously worked in international consulting for business process reengineering. He studied software engineering at the Software Park, Hagenberg. Martin Arendts is the founder and owner of ARENDTS ANWÄLTE law firm. He specialises in capital investments as well as gaming and betting laws. Isabelle Andres is CEO of Karina Square, a company providing consultancy services in the digital and media sector. She was previously CEO of Betclic Everest Group and has also held diverse positions in the digital and media sector. This report has been commissioned by bet-at-home and prepared and issued by Edison, in consideration of a fee payable by bet-at-home. Edison Investment Research standard fees are £49,500 pa for the production and broad dissemination of a detailed note (Outlook) following by regular (typically quarterly) update notes. Fees are paid upfront in cash without recourse. Edison may seek additional fees for the provision of roadshows and related IR services for the client but does not get remunerated for any investment banking services. We never take payment in stock, options or warrants for any of our services.